Located in Washington, DC, this office works with U.S. Congressional, executive, and regulatory offices to help them and the public gain a more accurate understanding of Christian Science. We follow developments in health care and insurance, and we work to ensure that spiritual health care services and the public’s access to them are not adversely affected by any law. I was always under the impression people were welcome to pray for themselves at any time — separation of Church and State, the State can’t tell me not to pray, so I’m really not sure why the Christian Science Church feels they need to be involved. The State can, and does, request that I pay taxes, our taxes go to schools, roads, public services (police, fire, etc. ), and that we have insurance (car, house, etc.). Render unto Caesar and all that good stuff. Ms. Eddy was clear that Christian Scientists follow the laws established by the State, which is interesting, because The Christian Science Committee on Publication’s U.S. Federal Office has been hard at work — again, lobbying Congress for health care exemptions — this time for an exemption to the Affordable Health Care Act. I’m NOT saying the Affordable Health Care Act is the answer, but health care in the United States is a mess, and the reforms with the ACA are a step towards at least doing something about the problem. Perhaps that is a little over-simplified, but if Christian Science prayer worked as well as the Christian Science lobbying machine we’d have a peaceful, disease-free utopia. Isn’t there a religious exemption from the ACA’s requirement to purchase health insurance? The religious organization must pay for the health care and disability costs of its members. 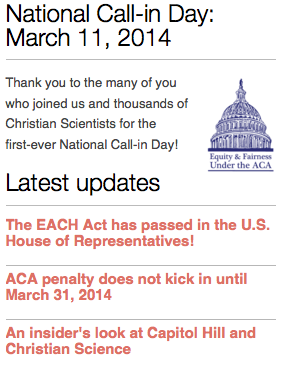 I don’t see Christian Scientists giving up their Social Security or Medicare benefits any time soon. If anything, they actively encourage members to seek out Medicare assistance to cover the cost of treatment at Christian Science Nursing care facilities. It’s unenforceable. There is no way the IRS would be able to accurately determine what a person’s religious beliefs are, much less how “sincerely held” they are. Therefore, ANYONE, whether they really refuse medical care or not, will be able to say they have religious beliefs against medical care and use that as an excuse to be exempted from the Affordable Care Act’s mandate to buy health insurance. It would gut the Act. Many sincere religious people object to only SOME kinds of medical treatment. Christian Scientists, for example, have broken bones set, get pre-natal and birth care, and often end up rushing to the emergency room when their prayers fail to heal them. If they are not covered by insurance, taxpayers must fill the gap. Even those objecting to ALL medical intervention will still receive it when they are unable to refuse it, say, after a car accident, and taxpayers must then pay the entire cost of that care also. The CBO has just released a fiscal analysis indicating that the bill could increase the number of uninsured by 500,000 persons each year and cost $1.5 billion over ten years. Parents who send children to religious schools are not exempt from taxes that support public schools. Religious people shouldn’t be exempt from this tax either. I hereby voluntarily withdraw my membership The First Church of Christ, Scientist, effective immediately, and request you to remove my name permanently from your membership records. My husband wrote a similar letter (actually, I just changed the names around and printed a second copy), but that didn’t stop The Mother Church from sending more propaganda — in October, they offered him a great deal on CS lit. 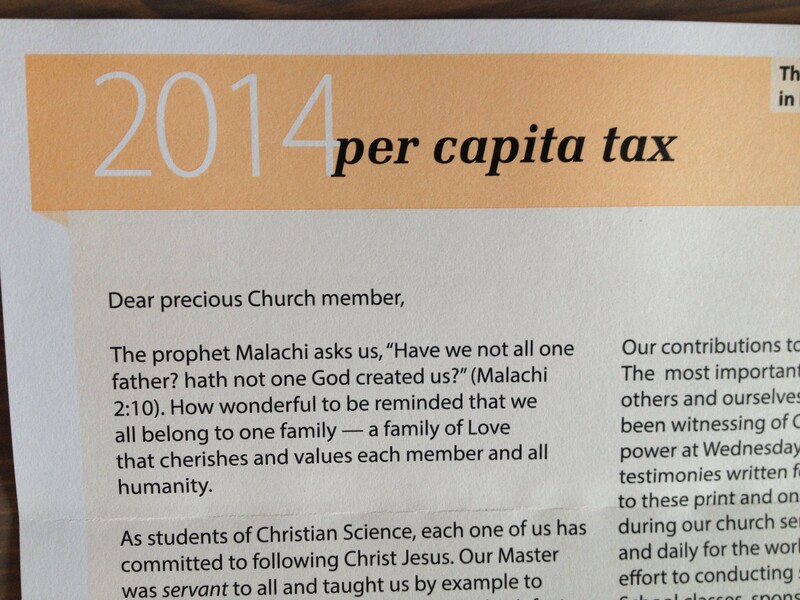 I didn’t hear anything from the Mother Church for eight months, and then in a recent trip to the mail box, the 2014 per capita tax arrived. On one hand, I am seriously tempted to send back the per capita tax form with another letter requesting to be removed from their list, on the other hand, I’m not sure it is worth the infinity stamp that such a letter would cost. The letter asserts that “what [Jesus] taught could be practiced by everyone.” I take issue with this, as Jesus’ disciples, who got first-hand on the job training failed to heal on several occasions, see Matthew 17:14-21, Mark 9:14-29, Luke 9:37-42, and Ms. Eddy herself reminds us all are privileged to work out their own salvation according to their light – which occasionally means falling back on the “right use of Temporary Means” loophole and going to a doctor. Our contributions to Church take many forms. The most important is our commitment to healing others and ourselves. We also share what we’ve been witnessing of Christ’s healing and saving power at Wednesday meetings and in articles and testimonies written for our periodicals. We subscribe to these print and online publications. We pray during our church services for our congregations and daily for the world. We devote time and effort to conducting services, teaching Sunday School classes, sponsoring lectures, and serving our community in Reading Rooms. We donate as generously as we can to support all our Church activities. I think the embedded hyperlinks speak for themselves. The Christian Science Board of directors closes with a reminder that my individual contribution to the “greatest and holiest of all causes,”* will bring “hope and healing to the world.” My contribution is to not partake in the culture of radical reliance and to work to distance myself and my family from all toxic aspects of Christian Science as much as possible. I’m also going to keep trying to leave the Mother Church. I will NOT link to the website here, but I did check it out. You can pay online, you can even set up monthly contributions from your credit card or debit card/checking account, you can contribute to other funds (MBE Library, Monitor operating fund, TMC endowment) but you can’t politely decline to contribute because you want to leave/have left the church. Jerks. As I see it, I do not have a per capita tax obligation because I sent in my letter of withdrawal and am not “obligated” to do anything, and the worst they can do – per the Manual’s direction – is drop me from the roster of Mother Church Members. I also don’t see what the big deal is about membership, Article VIII, Guidance of Members talks about “Numbering the People” in SECT. 28. which is strictly forbidden, or perhaps that is just to outside sources. Christian Scientists shall not report for publication the number of the members of The Mother Church, nor that of the branch churches. According to the Scripture they shall turn away from personality and numbering the people. I have been unable to find anything further about this. The Christian Scientists, unlike the Mormons, tend to be even more secretive about these sorts of issues. $148 off the cover price if you subscribe to both! It has been four months since I sent in my letter officially resigning from the Mother Church (see Parts 1, 2 and 3 if you are curious). When I printed out my letter, my husband found it and asked if I could change up the information and print one out for him too. I obliged, after all, we are in this together. So I sent in our letters, and for weeks we heard nothing. No letter of acknowledgement, no e-mail of angst, no phone call to see if we were serious or had changed our minds. Nothing. Then one day, a good three months after we’d mailed in our goodbyes, I checked the mail and found a plastic-wrapped packet of Christian Science propaganda addressed to my husband. Apparently the Church was curious if we had “seen our new look?” and had enclosed a copy of the Sentinel (from February 2013), and the Journal (also from February 2013). They had also thoughtfully enclosed a price list, with amazing offers: $148 off the cover price if you subscribe to both! 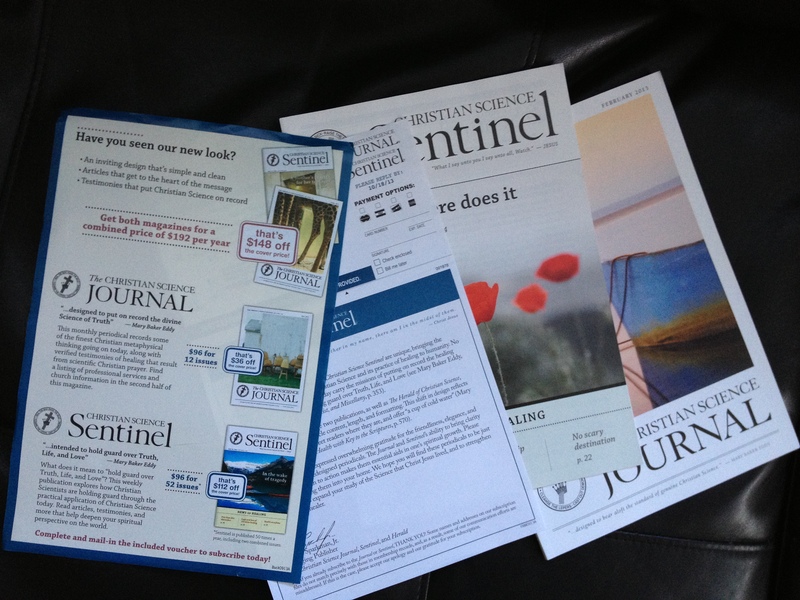 The Chrsistian Science Journal and the Christian Science Sentinel are unique, bringing the transforming ideas of genuine Christian Science and its practice of healing to humanity. No other publications in the world today carry on the missions of putting on record the healing Science of the Christ and hold Gaurd over Truth, Life, and Love (see Mary Baker Eddy, The First Church of Christ, Scientist, and Miscellany, p. 353). It is my sincerest hope that the only reason that we got this mailing is because they printed the labels well in advance and had not yet had the ouppertunity to remove my husband from their mailing list. It did cross my mind to go through and pick apart some of the articles, and the notion that the Sentinel and Journal are “essential aids in one’s spiritual growth.” I have not looked through them, and have no plans to do so. Beyond a quick photo for this blog, no trace of them will clutter our home further and they will now be promptly promoted to the recycling bin. A few weeks ago I was contacted by an author, spiritual healer and counselor in Australia who had come across kindism.org. She writes monthly inspirational news letters, and has recently posted some of them to her website/blog. I found her July message on “True Christian Science” (1) to be rather interesting. She begins with a list of things that Christian Science is not – it is pretty much NOT everything I’ve talked about. Christian Science is not a deadly culture of radical reliance, it is not about dwindling church attendance, it is not about ostracizing people who choose to take medicine, it is not about prolonged human suffering, etc. True Christian Science has apparently been “buried in layers of human ridiculousness.” Essentially everything that is going on with the way Christian Science is currently practiced is NOT really Christian Science. The “NOT really Christian Science” line is hauled out time and time again, usually when a healing fails to occur, or someone dies. If they had really been practicing CS “properly” any number of miracles would have occurred. When in doubt, blame the victim’s lack of spiritual understanding. It is a rallying cry used time and time again by CS-apologists. The religion is not at fault: they did not pray properly, they should have sought medical treatment (unless of course they did, and then they’re still bad because they didn’t rely totally on God), something about them was some how lacking. I find it interesting that the “NOT really Christian Science” line is also used by those trying to distance themselves from the archaic, judgmental, dieing out TMC movement. Apparently “True Christian Scientists, and metaphysicians of all disciplines, have a revolutionary way of seeing life.” Which is great and all, but I don’t think Christian Science has anything to do with it. “God” might not mind, but Mary Baker Eddy the DISCOVERER AND FOUNDER OF CHRISTIAN SCIENCE – was pretty clear about what Christian Scientists should read – her works, and Church-Authorized lit, who we listen to – she set up the lessons so that there would only be readings from the Bible and Science & Health, and what church we should attend – ones that are in line with The Mother Church. Everything is neatly laid out in the Church Manual. Christian Science and the governing laws and requirements are a COMPLETE HUMAN FABRICATION. I agree, “We have our unconditional freedom to explore and go wherever is most helpful to us, whenever we feel so inspired, and to do whatever we consider to be in the highest interest of our growth and destiny.” I also happen to feel that has NOTHING TO DO WITH CHRISTIAN SCIENCE. I agree, any higher power worth paying attention to should not mind if we go to church (or not), the world is full of ouppertunity, and we should live free of guilt and fear, but I’m not going to call these ideas Christian Science, true or otherwise. Christian Science, as DISCOVERED and FOUNDED by Ms. Eddy, is not Christian, or scientific. It is full of FLAWED HUMAN FABRICATION. I also happen to think the writer in question is has some good insights, and I look forward to reading more of her work. A little while back the Ithaca Journal ran a piece about Liz Heywood and her experience with Christian Science as a child (1). Shortly thereafter, someone wrote in to the Ithaca Journal with a follow up in-defense-of-CS article, and Ms. Heywood has since added her perspective to the ongoing discussion (2). Article X Section 1 No Unauthorized Debating. SECTION 1. A member of this Church shall not debate on Christian Science in public debating assemblies, without the consent of the Board of Directors. I’m not sure if what the well-meaning Ms. Case did was a violation of ARTICLE X, and I don’t really care much one way or the other. Reading over her rebuttal the arguments sounded hollow. 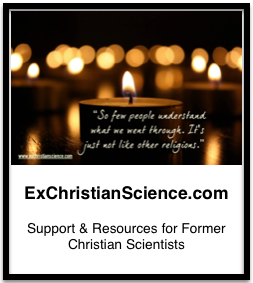 Christian Scientists do not deny the legitimacy of responsible medical practice, but in their experience they find that Christian Science treatment is most often equally or more effective than any material means of healing. For more than a century in Ithaca, the surrounding areas and throughout the entire world, children have been raised in Christian Science. They are taught moral and spiritual truths which keep them happy and healthy. They are taught to have compassion for all humanity. They are taught how to heal through prayer, and they do experience healing in their lives. I’ve got two young children, they’re usually happy and healthy and I’ve managed to raise them WITHOUT CHRISTIAN SCIENCE. Happy and healthy is how they usually are. It is possible to teach compassion for humanity without layering in the CS-induced guilt over failure. Teaching “how to heal through prayer” is only going to set them up for a lifetime of self-denial and an overwhelming feeling of failure (failure to heal, failure to properly understand, failure to practice CS properly, failure to know the right Truth), no one needs that kind of pressure. My problem with praying for days, week, months and nothing happens is that Jesus always got his healing immediately. I see no Biblical support for having Jesus on the job for a length of time before the demonstration was made. He was able to heal immediately. …. I think requiring healing of average members over their own cases, or children over theirs, is like asking a child who just began ballet class last fall, to do split leaps and multiple pirouettes and always end in a perfect turned out fifth position. CS claims to have rediscovered Jesus’ method of healing, but it doesn’t work for that % that is not something easily healed WITHOUT prayer. I would like to take it one step further and ask exactly how this healing is supposed to be taught. If seventeen years of regular Sunday School attendance is not enough then what is? Either people are capable of having amazing physical healings through prayer or they’re not. Either you can teach this amazing Science or you can’t. In extreme cases the difference here is quite literally life or death. If it really is a “science” it should be able to hold up to scrutiny and should be able to work consistently every time. There has never been a system of religion or medicine which has a perfect record of healing all human ills. Every system has its successes and its failures. And the experience of any one individual, whether good or bad, does not prove or disprove the worth of any system of religion or medicine. Christian Science has a excellent, well-documented record of healing, and when practiced consistently and responsibly, it brings harmony to all aspects of human experience. The one man who never failed in healing was Jesus. Jesus’ disciples failed to cast demons out of a young child in Matthew 17:14-21, but Jesus never failed. Jesus rose from the dead and went on to ascend (3). Jesus’ closest followers and students could not heal 100% of the time and did NOT ascend. Ms. Eddy’s track record is even more dismal, and when her “healing science” failed to heal she blamed mortal mind, aggressive mental suggestion, or the patient’s lack of understanding (4). The biggest difference in Jesus’ healing as opposed to Ms. Eddys’ is Jesus’ healing was instantaneous, healing as practiced in Christian Science may take a little while (5). A little while is not good enough. Either you are better NOW or you are not. There is no need for a prolonged struggle with “aggressive mental suggestion.” Living in denial about a problem under the guise of “praying about it” does not make it go away, yes, sometimes the problem solves itself, the human body is pretty amazing, but that does not mean a “CS healing” occurred. Further recommended reading: fellow former CS blogger, Emerging Gently has posted an excellent piece entitled Blame the Victim which also discusses the “CS is never the problem they just practiced it wrong” mentality which is pervasive in CS culture. at least that’s what the Bible says, now, they may have omitted some things, and Jesus may or may not have been real, but seeing as Christian Science is founded on the rediscovery of Jesus’ long-lost art of healing, let’s just go with it. Noticing a theme here? Christian Science is never at fault. Actually in CS all healing is “instantaneous” — the moment the person knows the Truth they’ll be healed. Right.